In this case, the beginning part is one of the most epic train car derailments ever in the history of cinema in the entire world, no hyperbole needed. The derailment takes place when a bunch of kids are filming a Super 8 movie at the local train station. The year is 1979. Then the military mysteriously swoops in and random and bizarre things go missing. Like telephone lines. I’m phrasing these things in a way that seems snarky and mocking, but really, it’s a popcorn movie and that’s pretty much how you should phrase those things in advertisements for popcorn movies. “In a world without telephone lines, a train crashes, the year… 1979.” And so on. I really enjoyed Super 8, and not just for Ron Eldard causing me to double and triple take for mistaking him for Iggy Pop numerous times. Not just for Dan Castellaneta’s wonderful cameo as a used car salesman with a terrible wig. The movie is quite well executed, and it certainly accomplishes what Abrams set out to do, making an homage to producer Steven Spielberg’s earlier movies. 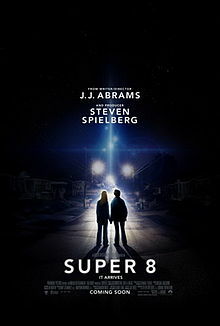 I would go on record as saying that Super 8 is a modern-day Goonies but that’s kinda silly since Super 8 takes place in 1979 and The Goonies is one of those perfect 80’s movies that defined that decade of film.